And the Jumu'ah (prayer) has a first adhaan which is from the Sunnah of Uthmaan (radiyallaahu anhu), and he is one of the rightly-guided Caliphs whose Sunnah we have been commanded to follow. 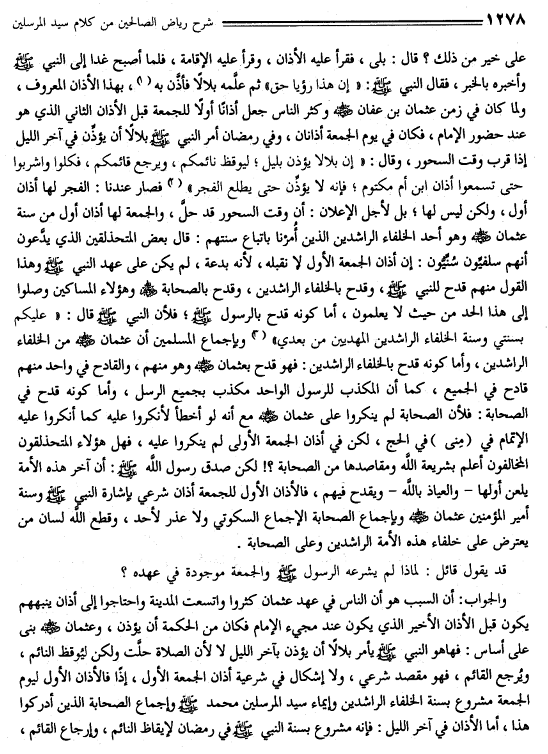 Some of those pretending to be clever who claim that they are Salafis, Sunnis say: We do not accept the first adhaan of Jumu'ah, it is a bid'ah, it was not present in the time of the Prophet (sallallaahu alayhi wasallam). This statement of theirs is a revilement upon the Prophet (sallallaahu alayhi wasallam), a revilement upon the rightly-guided Caliphs and a revilement upon the Companions. And these paupers reached this limit without knowing. As for it being a revilement upon the Messenger (sallallaahu alayhi wasallam), it is because the Prophet (sallallaahu alayhi wasallam) said, "You must follow my Sunnah and the Sunnah of the rightly-guided Caliphs after me." And by consensus of the Muslims, Uthmaan (radiyallaahu anhu) is from the the rightly-guided caliphs. And as for it being a revilement upon the rightly-guided Caliphs, then it is a revilement upon Uthmaan (radiyallaahu anhum) and he is from them. And the one who reviles one of them, he reviles all of them, just like the one who rejects a single Messenger, he is a rejector of all of the Messengers. And as for it being a revilement of the Companions, then it is beacuse the Companions did not show rejection against Uthmaan (radiyallaahu anhu) alongside the fact that if he had erred (in this matter), they would have rejected just as they rejected him completing (the prayer) whilst in Mina during Hajj. However, regarding the first adhaan of Jumu'ah, they did not show rejection against him. So are these opposers who are pretending to be clever more knowledgeable of the Shari'ah and its objectives than the Companions?! However, the Messenger of Allaah (sallallaahu alayhi wasallam) spoke the truth when he said, "The latter part of this uymmah will curse its first part" and refuge is with Allah, and he reviles them. So the first adhaan is a legislated adhaan by indication of the Prophet (sallallahu alayhi wasallam) and the Sunnah of the chief of the believers Uthmaan (radiyallaahu anhu) and by consensus of the Companions, with an ijmaa' sukootee, and no one has any excuse, may Allaah cut the tongue of the one who criticizes the rightly-guided Caliphs of this ummah and the Companions. Someone might say: Why did the Messenger (sallallaahu alayhi wasallam) not legislate it whilst the Jumu'ah (prayer) was present in his era? The answer: That the reason was the people increased in the time of Uthmaan and Madeenah expanded and they were in need of an adhaan to notify them before the later adhaan which is done when the Imaam arrives, so it was from wisdom that such an adhaan (be made). And Uthmaan (radiyallaahu anhu) built this upon the basis that the Prophet (sallallaahu alayhi wasallam) commanded Bilal to make adhaan at the end of the night, not because the (Fajr) prayer had entered but in order to awaken those who were sleep and to alert those praying at night (to end their night-prayer). Hence it is an objective recognized by the legislation and there is no problem in the legislative nature of the first adhaan of Jumu'ah. Hence, the first adhaan on the day of Jumu'ah is legislated by the Sunnah of the rightly-guided Caliphs and the indication of the Chief of the Messengers (sallallaahu alayhi wasallam) and the consensus of the Companions who reached (the time when this adhaan was instituted).